The Gerry Adams “visionary” mural came down almost as quickly as it went up. Five days after release, Adams posted a thank-you to the artist on Twitter in which he also asked that it be replaced. 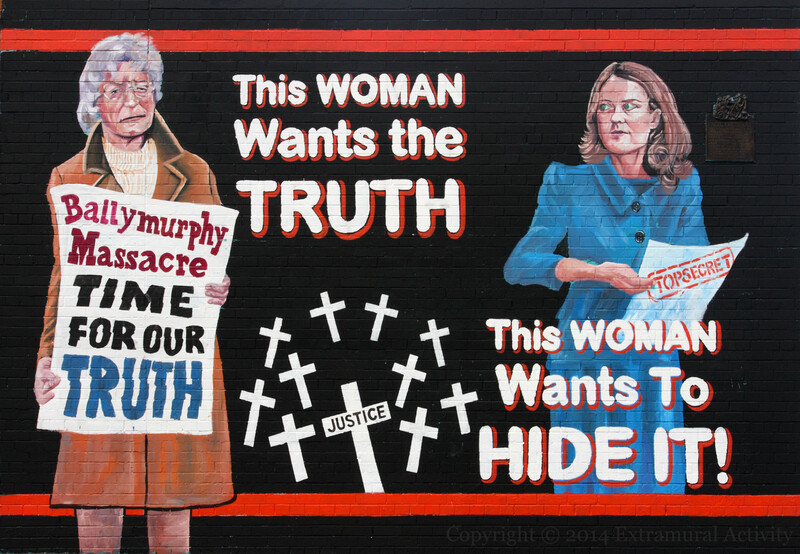 The new mural returns to the issue that made headlines immediately before Adams’s arrest: the refusal of NI Secretary Theresa Villiers (depicted on the right) to order further investigation of the shooting deaths of 11 Ballymurphy residents – one for each cross shown – in 1971 (BelTel) and also the La Mon restaurant fire-bombing in which 12 people died (BelTel). Again, the irony in this image seems to have escaped Sinn Féin or the people of Belfast. Or maybe I am crediting this with too much pulling power, simply because it interests me from a social/cultural anthropological perspective doesn’t mean the public at large give a toss about it. Certainly the rent-a-crowd for the unveiling of the previous crime against art was hideously tiny compared to what was, back in the day – and maybe that’s the reality here; we are debating a novelty – a photo of two terribly rendered people posted on a website. Does that make it relevant, or famous? not necessarily, although of course SF wishes otherwise. Why is this image ironic, you ask? Well, the lady on the left who, one presumes is a relative of one of the individuals killed in the war by enemy combatants on the side of the State (no, this was not a ‘massacre’ – check the dictionary (http://encyclopedia.thefreedictionary.com/Massacre) wants ‘justice’ (define terms) and apparently the other lady won’t give it to her. Ok… so put Jean McConville on the right and Gerard “Gerry” Adams TD on the left and bingo! You get the very same narrative… Only in this case Jean McConville is interchangeable with any of the ‘disappeared’ or indeed any of the 1701 people killed in the war by the IRA (source: http://cain.ulst.ac.uk/sutton/tables/Organisation_Responsible.html) many of whom would still like to see truth and justice. It boggles my mind how Republicans don’t get this, how they think they have a monopoly on victimhood – how they are the only ones who have a right to redress, to ‘justice’ and ‘truth’ and when they don’t get it they stamp and scram like a nine year old child.